Galerie Myrtis presents its first solo exhibition of works by painter Ronald Jackson. 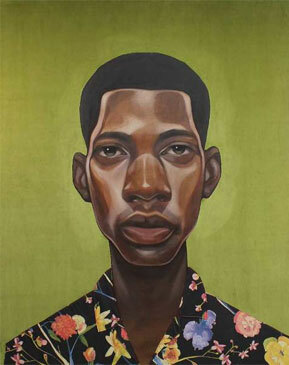 Profiles of Color III: Fabric, Face, and Form is the third iteration of portrait paintings in which Jackson employs mixed media collage techniques and oil paint to further his exploration in re-imagining African American portraiture. Vivid hues, geometric shapes, and rich fabrics result in dramatic faces – some with painted floral masks, engulfed in bursts of color, offering fanciful narratives from his imagination. The opening reception will be held on Saturday, June 30th, 5:00pm – 7:00pm. The exhibit runs from June 30th through July 28th. Tuesday – Wednesday by appointment. Thursday – Saturday 2:00pm – 6:00pm. Hours extended during special events.